I bought several of these panels. These are absolutely gorgeous!!! I bought the eggshell color, it is very close to white, but it perfect. These are amazing quality and look stunning when the sun shimmers off them! They are nice and thick and keep the cold out too. This might be my best Overstock purchase yet!!! So thrilled! Decorate your home in delicate hauteur with these taffeta ruched header curtains. Woven from durable and resilient polyester, you'll be treated to soft elegance for years to come. Available in numerous color options. I held these in my "shopping cart" with someone else for over a year as I wasn't willing to pay 'their' price! Saw them at Overstock at half the price. Bought them immediately. The are stunning in my bedroom and actually prettier than the picture shows. This took a total of 6 panels. They are completely lined and very well made. I purchased the 96" and they fit my high ceilings beautifully. PERFECT! I was excited waiting for these to come in the Eggshell color. Terribly disappointed when they arrived looking pure white in color (I was expecting more of a cream color than plain white). And even after putting them up, the Ruched Header at the top just drooped! Not sitting pretty and fluffed up as they do in the picture. I even called Overstock customer service to see if they could give me some tips on how to achieve this look and was unsuccessful. If you bought these and know how to manipulate the top to get this nice ruched effect please write a review leaving instructions or do a YouTube tutorial for us to follow. I sent mine back as I had no use for them after failed attempts to achieve this look. But will buy them again if I can get the look. I love these curtains. It was hard trying to figure out the header, but they are so pretty overall. I have not had draperies in my home for a long time, and while repainting I saw these at Overstock. They are absolutely stunning! The lining is heavy and weighted so they fall easily. I put the antique beige in my family room and eggshell in my dining room. The antique beige has a slight gold to it, perfect, and the eggshell is really white. I would not hesitate to recommend these draperies and would put them in every room of the house if I could! These are absolutely beautiful up. Great quality heavy fabrics and fully lined. These curtains were the PERFECT amount of elegance I needed. The quality is amazing!!! I ordered a total of 6 of the antique beige for my open floor formal living/dining room. You wont be disappointed at all. I purchased these curtains for my formal dining room and they do not disappoint. They definitely add elegance and flare. Be advised that the top does not come in the tight rolls as depicted on the photos and there are no instructions as to how to create that effect. I was able to finally do so by manipulating the top using rings and clips. Beautiful curtains! The top was kinda hard to fix but after I played around with it a little it got easier. They will fluff up nice and full. They look so expensive and they look like real silk. Make sure to go up in size because the top takes up a lot of length. Excellent quality , great touch to my living room. Great love them match my room great. These curtains are beyond gorgeous. Better then I could have ever imagine. These are beautiful in my formal living room. I love the fabric and the puckering at the top. I absolutely love them! I have the Platinum colored ones, and they look excellent. They match the dining table, buffet, and chairs that I bought perfectly. Looks like I win, win, win. "I would love to have these drapes in graphite...96 l...will that be available? Are they just out of stock.."
Unfortunately, we do not have a re-stock date for this item . We apologize for any inconvenience. "In Almond color only 1 panel is available, when can we expect more? I want to order 4"
"Does these curtains come in a pair or is it just one panel?" Each order contains one panel with attached ruched header. "Thanks for responding! The hooks came with the curtains. They are not curtain rod hooks. Can you tell me how we are supposed to use them?" I'm sorry for the wrong information. The warehouse is still telling me that this does not come with the rings. If you received rings with a little look on the end you would put that loop through the hooks on the curtains. 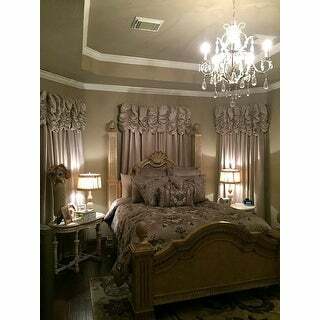 "We just purchased the curtains and they look beautiful! What do we use the hooks for? They definitely wouldn't fit on a rod. Are they necessary if we are hanging the curtains directly on the rod?" This item is beautiful! It features a pole pocket with 18 inch ruched header or can be hung using rings, such as ITEM# 13404534. "Does this come in the jet black? Will this item be restocked?" Hello fitzpgirl, items are restocked as they become available; however, we cannot guarantee an item will be restocked. Thank you for shopping with us. 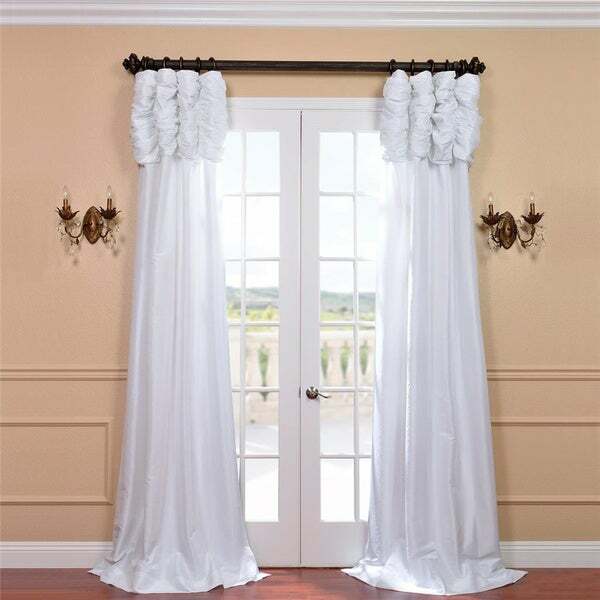 "Am I getting 2 curtains in side package because your calling it a set,but when I read reviews people are saying you get one inside if so why call it a set, so is it one or 2 inside the package "
Hello nicole g., this is not a set. This is 1 panel. Have a great day!